A short drive toward the coast from São Paulo's bustling concrete jungle, is Paulista Coast - a quintessential tropical paradise. Here, the seemingly endless stretch of a white sanded beach, crystal blue waters, tiny nearby islands to hop around on, and a handful of contempo-tropical holiday homes are what make this South Atlantic destination a wonderfully indolent getaway. 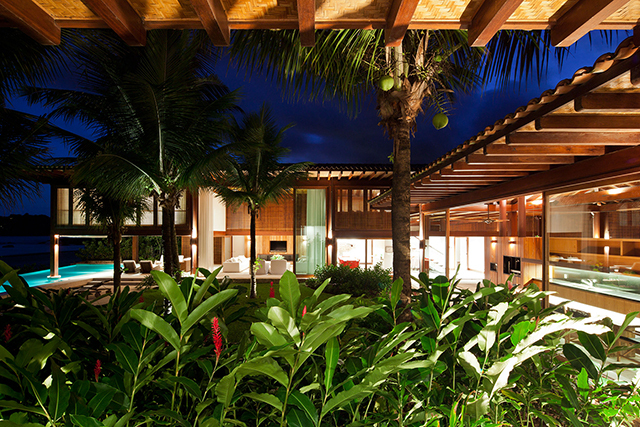 The latest of tropical homes to grace the Paulista Coast is Recidencia MC, designed by the São Paulo-based architects at Jacobsen Arquitetura. The stunning 13,000 square foot, three-tiered home is situated on a half acre plot of land directly on the Paulista shoreline, with a neighboring home visible on one side. With privacy being one of the main issues for the owners, Principal architect Paulo Jacobsen implemented a U-shaped design, which created an exterior courtyard and an indoor garden that have direct views of the beach. This architectural layout allows a connection of internal and external social areas. In addition to implementing a U-shaped design layout, Jacobsen developed a perforated wood paneling system that outfits the exterior of the home - helping to maintain privacy, but allows ventilation and natural lighting to filter in. On the second floor, the perforated panels slide open to intersect the interior of the home with the refreshing outside scenery of the Paulista Coast - with a glass railing functioning as a visually silent barrier. On the inside of the U-shape, the homeowners can enjoy their privacy while still embracing the openness of the home and its tropical surroundings. Walls retract and the windows open at the spaces that are located on the inside of the "U". The kitchen and the grand living room become fully exposed to the courtyard and neighboring ocean. An important aim of the project was to work with local elements and traditional building techniques to maintain the home's authenticity to its location. In addition to the open kitchen, awe-inspiring living rooms, indoor garden, and home theater, a contemporary spa was built on the lower level of the home. 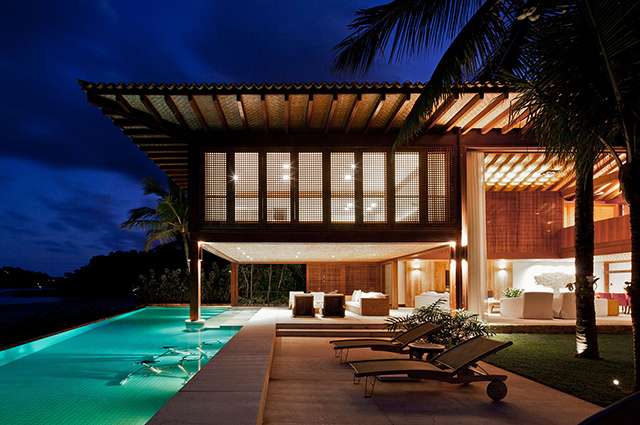 Here, a sauna, pool, and sleek wood lounging area team up to create a secluded and tranquil spot for the vacationers. A true home away from home.